Fall Quilt Market 2013 was held last weekend in Houston, Texas. 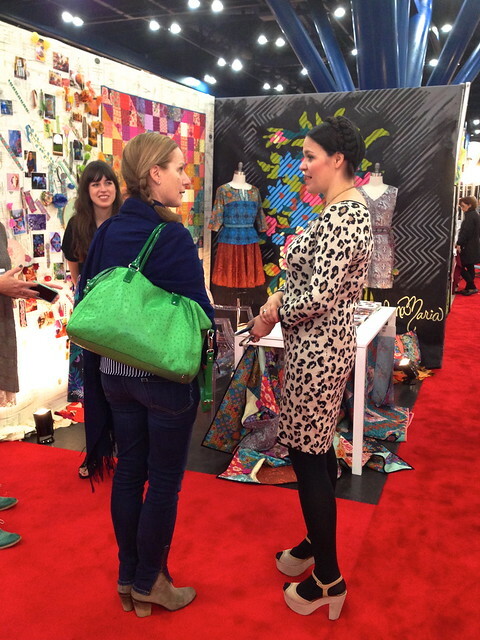 This open-to-the-trade wholesale show takes place twice per year. 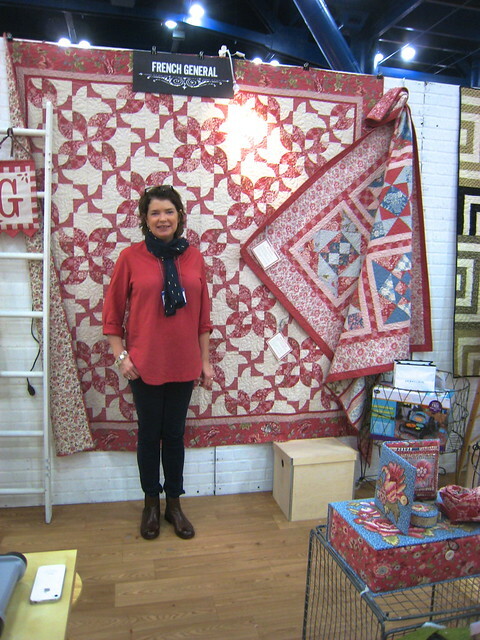 Houston hosts the Fall show which is then followed by Quilt Festival (open to the public). 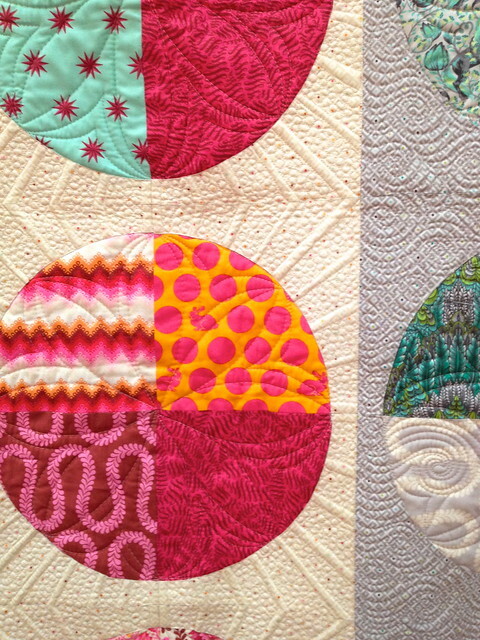 Each May, the Spring show rotates between 5 cities located across the US making it more accessible to quilt shop owners in different regions of the country. I attend the show to keep current on market trends, network with other shop owners, and breathe! It’s so easy to get caught-up in the day-to-day operations of the shop that I forget to do all three. As a bit of an introvert, it seems odd that traveling to a large industry show would give me the solace I need to think but it works. I’m topped-off with enthusiasm, ideas are swirling, and I’m feeling centered and balanced. All these things fuel my effectiveness as a small business owner. At last year’s Fall Market, vendors appeared to be incorporating the word ‘Modern’ into their product labeling everywhere I turned. To the point I had no idea what meaning the word held anymore. Since the tag line for Pink Chalk Fabrics is ‘cloth, pattern + tool for the modern sewist’ I’ve always had a few opinions about this topic! When I started the shop 5 1/2 years ago my use of the word ‘Modern’ related to attitude over aesthetic. An attitude of fearless experimentation, pushing boundaries, redefining what it means to sew, personal expression through our work, and defining for ourselves what we like and how we go about making it. A passion for individualism and unique creative endeavor. This is not to say I’m the only person that has an appropriate definition of the term. Exactly opposite. 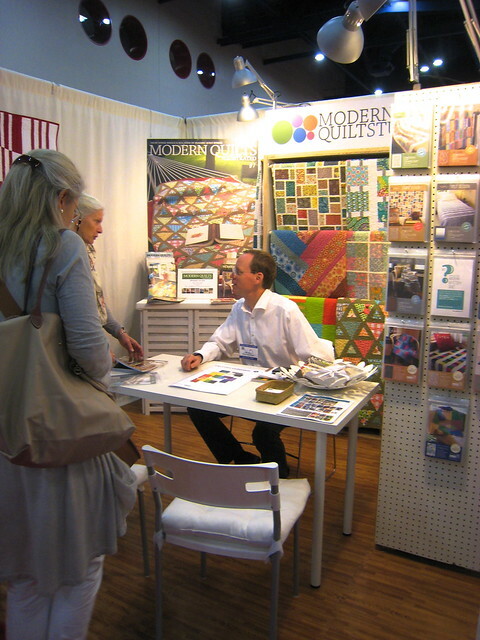 Other uses of the term Modern within the quilting and sewing world embody the idea and further expand and define it. I’m going to refrain from shouting out my opinion with examples on this point because it ultimately lies in the eye of the beholder. There is no single way to define the word and no one owns it. I do think I can spot a good use when I see it and vice versa, when it’s maybe a stretch and used for marketing rather than to genuinely express a point of view. Well, I’m here to report, that I observed an almost overnight cessation of the practice of plastering Modern on anything and everything. I saw some amazingly great new things that were tagged ‘Modern’ and that gave me hope that the movement in its truest form will continue on. It will evolve, grow, progress, and become what it will. Just as we do as sewists. – From the heart. I attended a class entitled The Success of Passion. The panel included Jo Packham creator of Where Women Create, Kaari Meng of French General, Nancy Soriano, and Eileen Hall. Each shared their story of creating a business and making a living through their creative passion. Incredibly inspiring. It reminded me that I have gifts and, equally important, choices on how I use those gifts. Often times it’s a wild ride of intuition, doing the next right thing, and nurturing our creative vision through persistence, hard work, and perseverance. And, of course, a few lucky breaks sprinkled in along the way to keep the faith. Innovation comes when we combine courage, faith and action. Kaari Meng recommended two books both by Twyla Tharp, The Creative Habit and The Collaborative Habit. – In action. 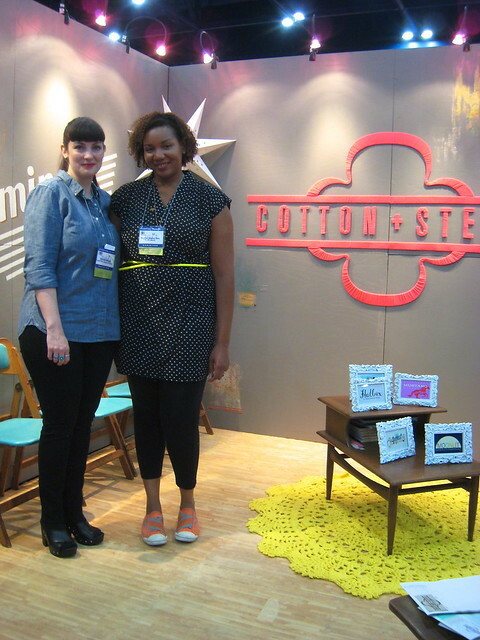 Melody Miller, Rashida Coleman-Hale, Alexia Abegg, Kim Kight, and Sarah Watts teamed with RJR to launch Cotton + Steel, a new division of RJR Fabrics. Fresh, innovative, brave. Watch the video for the story. – Simple, practical, perfect. Denyse Schmidt Modern Solids, 75 modern solid essentials hand-picked by Denyse Schmidt from the Free Spirit Fabrics Designer Solids collection. Pre-cuts and bundles will be available in 2014. This was an announcement, no specific dates on when they’ll ship. I can’t even order yet. – Community. Every time I turned around I was having a conversation with someone about a retreat, a class, an online sew-along, a guild event, you name it, it is being planned, organized and executed by quilters and sewists all over the world. It’s about bringing us together to share our passion. Do good works. Connect as individuals. Positivity through creativity. Cristy Fincher was handing out buttons she made that carried the message ‘Quilting Matters’. It truly does. Whew. It was getting to be a little crazy there for awhile. So many new collections being released in rapid fire. Multiple collections from the same designer in a single year. I literally have not been able to keep up. Uncle! Well, I think the manufacturers got a little tired trying to set that pace. I observed a marked reduction in the number of collections I was being shown and in the number of designs in each collection. Thank goodness! I saw many well curated, thoughtfully produced collections. Let’s hope this trend has legs! 1. Moda Slice. Delicious 10″ triangles. A layer cake cut in half diagonally. Some of the collections will be available in this pre-cut. I was most excited about this Make a Splash set that contains 48 10″ triangles of 12 assorted Bella Solids. Quilt pattern included. 2. Modern Quilt Relish. Two new quilt patterns, Torte and Cutlery. Cutlery features 12 Solid FQs for the throw size. 4. 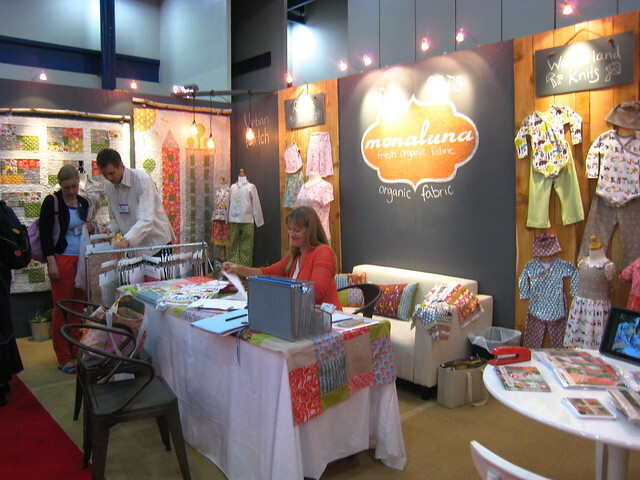 Monaluna Knits. 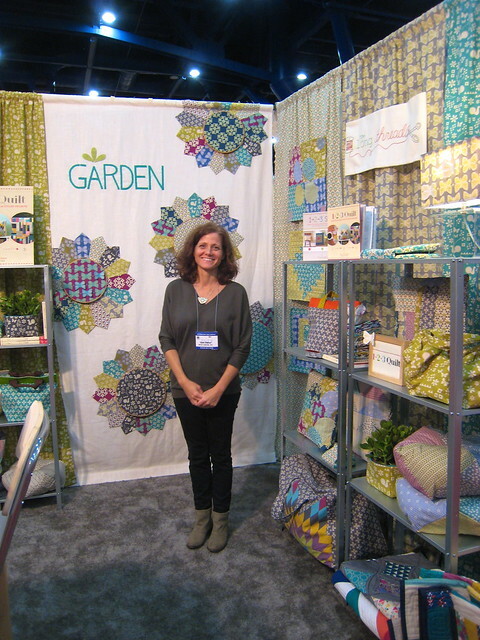 Jennifer Moore is both a talented designer and organic fabric manufacturer. Exciting to see the addition of knits. 5. Lizzy House Cat Nap. One of my favorite collections from market. Also one of my favorite people along with her extremely talented and lovely mom Cherri House who I got to see too. 6. Modern Solids II by Alissa Haight Carlton for In The Beginning Fabrics. 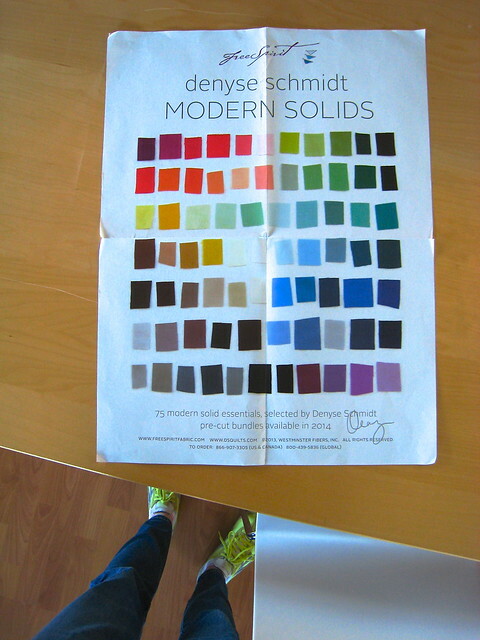 Modern Solids from ITBF is my favorite new basic in 2013. 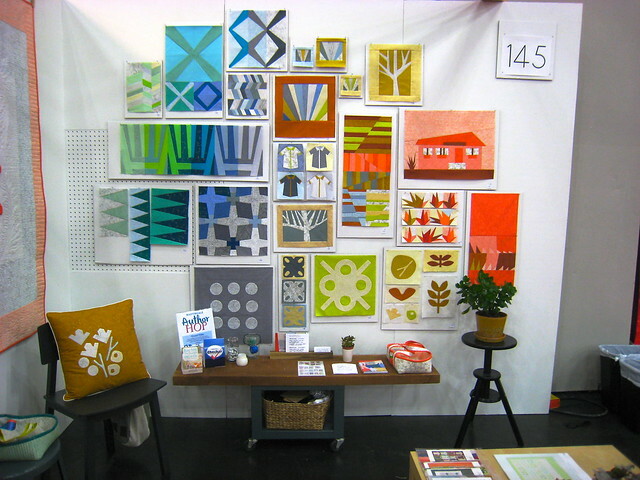 The addition of these brights designed by Alissa push my LOVE over the top. Yahoo! 8. 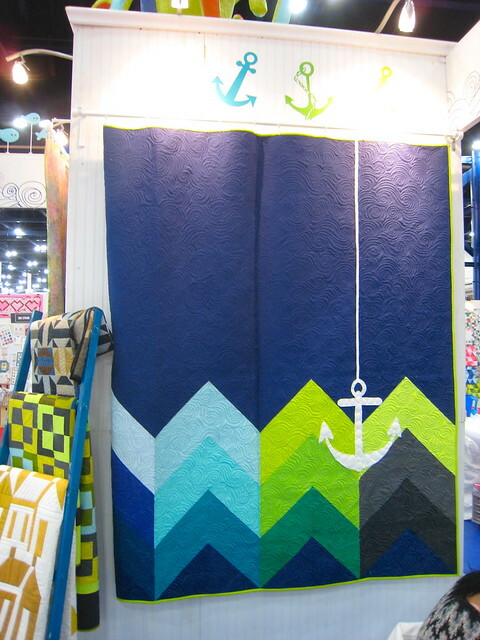 The Color Call by Modern Quilt Studio. A set of 30 tone-on-tone basics spanning the color wheel by Bill Kerr and Weeks Ringle. Supports the value techniques they teach in their patterns. Innovative – taking things to another creative level. See full gallery of pictures on our Pinterest Fall 2013 Quilt Market Board. A signed copy of 1-2-3 Quilt by Ellen Luckett Baker! 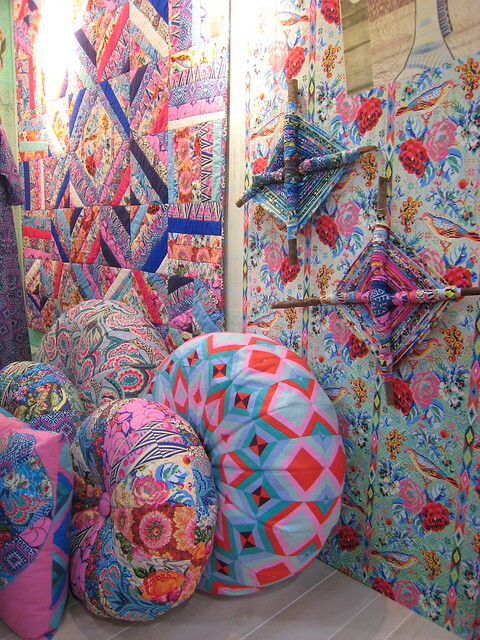 Leave a comment sharing what you think is most exciting about the trends coming out of Fall Quilt Market 2013. I love seeing all the new quilt patterns. Although I didn’t go to Market, I have been reading lots of updates. Between those updates and other postings, it seems like I have seen a lot of really new patterns. And the number of new fabrics that I have seen are less overwhelming to think about. I was so excited to see the kitty cat fabric from lizzy house. Thanks for a great report! I always look forward to hearing your take. 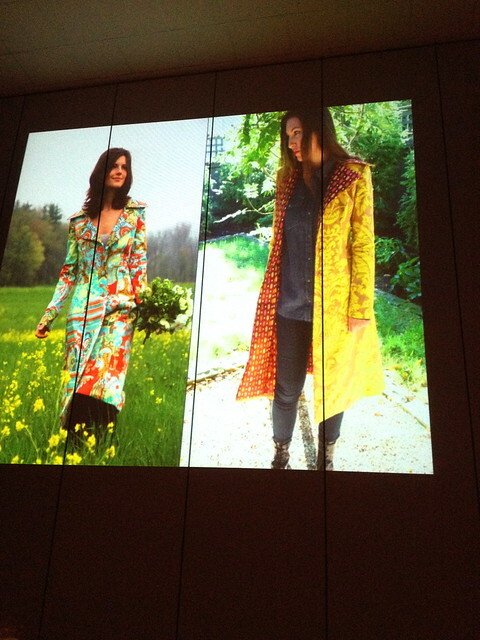 I think Carolyn Friedlander’s new line and patterns will be huge. Her last collection was so refreshingly light and different from everything else… Very graphic and textural without being heavy and linear. Can’t wait to see more of what she does! It is refreshing to read that there will be be fewer and better thought-out fabric lines this year. I agree that it became overwhelming the past few years. Hopefully lines will stay around a bit longer too. I’m actually excited to hear that there will be less fabric released next year. All of the new collections can be overwhelming, and the push to buy what’s new right now is ever present. It will be nice to see fewer, better collections! Also, I’m very excited to see what Cotton and Steel will come up with. And I always love new garment patterns. I’m looking forward to some solid collections other than Kona. What bright colors I see in your photos. Love them. this cotton+steel is really intriguing, can’t wait to see what they come up with! Cotton & Steel -definitely, can’t wait to see what they do!! 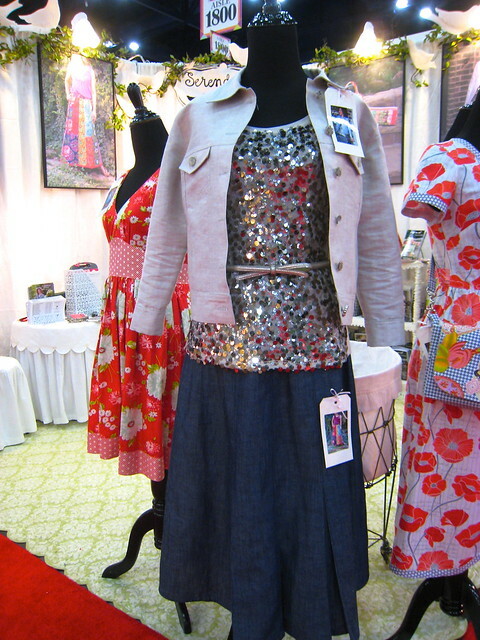 I love the jacket from Serendipity! Selfishly I’m most excited about the new solids because I don’t adore Kona’s (though I don’t have a LQS so I’ll probably end up buying them sight-unseen from you!). Big-picture, fewer collections sounds good — I’ve had some overload this year and pretty much stopped buying even stuff I liked, as sewing time was so undeniably slipping away from the pace of acquisition! Thanks for posting about Cotton & Steel – I just loved watching that video. I hope they can bring that intensity to life on fabrics and with projects – so inspiring. I CANNOT WAIT to see what comes out of Cotton+Steel. Amazing talent there! The most interesting thing most people are talking about is personal freedom and creativity that was a little more visible to most of the bloggers I have read. Less fitting a mold, more what the artist likes. Im thrilled to see manufacturers embracing new ways of doing things (cotton and steel) while responding to trends in moderation. I think the most exciting thing about this is the collaboration of makers, I’m particularly looking forward to seeing what Cotton + Steel do. I’m increasingly becoming interested in making garments, so I like seeing patterns, especially in quilting fabric. Thanks for the lowdown!! Yes, fewer collections, I like that! Sounds crazy, but I like to have a fighting chance at being able to keep up with what’s coming out. I’m looking forward to the new solids, too, esp Alissa’s. Thanks! I’d be so excited to win — I’m a big fan of Architextures (who isn’t) and I can’t wait for Botanics! I love that more clothing patterns are being produced and in styles that I actually would like to make. But don’t look like I could never manage. And I also love the continuation of bold strong colours, wonderful jewel tones that just appeal to me totally. Best Market wrap-up I’ve read so far! All your thoughts are spot-on, in my opinion. I liked a lot of what I saw at this Market. 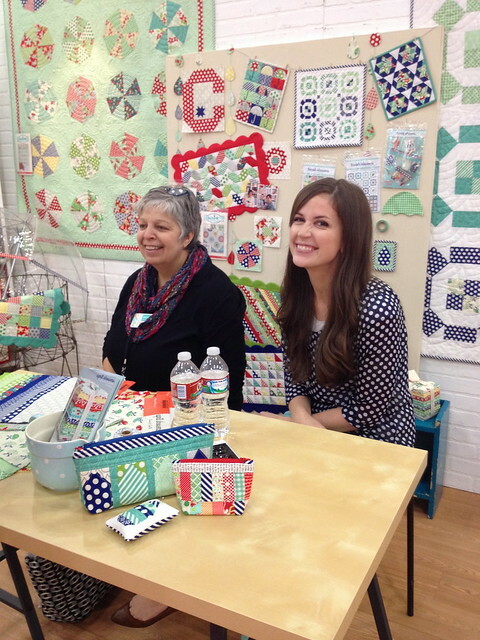 community and passion – that’s what I’m feeling regarding quilt market “trends.” As someone who has been a quilter for many, many years, I share the excitement of evolving, being a life learner; learning from others and challenging myself. 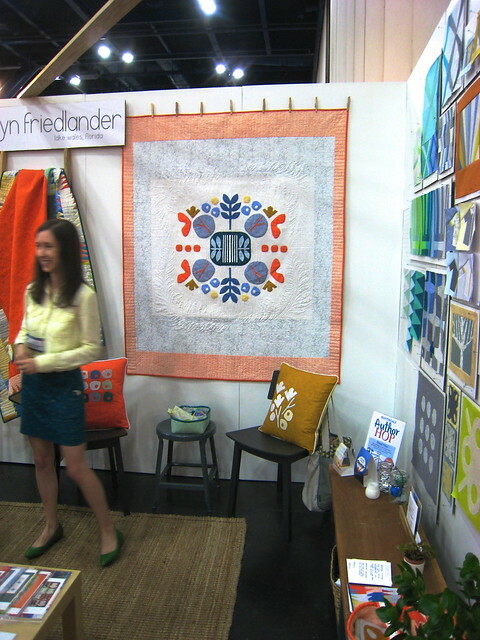 it looks like bright colors in simple graphic formatting seems to be the trend for modern contemporary quilts. love the orange highlights. Oh,oh…must have that Botanics line by Carolyn Friedlander! And the tone on tones from Kerr and Ringle. I much prefer tone on tones to high-contrast fabrics for basic patchwork. Thanks! Thanks for the report. I’m especially glad to hear that the trend of slapping “modern” on everything is waning. And excited to see more solid options coming out! i was so excited to see many of my favorite designers launching cotton + steel! though i wish we could have seen even a peek of their collections. this is seriously my dream team. I just read the post on Quilt Market. I especially enjoyed the video from Cotton+Steel. I will be looking to see what comes from these talented ladies. 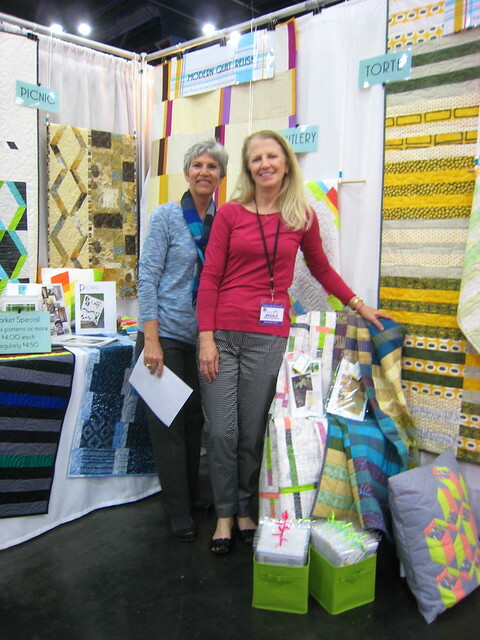 Most comprehensive and thought-provoking post I have read online about Quilt market. Thank you. Most definitely excited by less and better curated fabric collections. At times it seems as if we quilters have been bombarded with an incessant stream of mediocre fabric releases with only a few gems in between. It’s not inspiring. I am loving the use of solids. Great post! Thank you for sharing your take on market for those of us who couldn’t go 🙂 I’m excited about the idea of fewer lines and coming out at a more reasonable pace. To be honest I have given up trying to keep on top of what’s new, I have fabric fatigue and buy less as a result. I look forward to what 2014 brings! The new solids look wonderful! I’m so happy to see the clothing side of sewing coming back too–more ways to use beautiful fabric. Wow! Great thoughts and recap here. I have totally felt we have been bombarded with collection after collection over the past year. I’d much rather have some well curated and impressive lines than more quantity over quality. From the pictures I saw colour trends also seem to be more sophisticated, in a subdued, off-centre tonal shift. (Botanics being a great example of this). An interesting journey 2014 will be! I’m excited to have more solid color options and I can’t wait for Botanics! Although I love all of the fabric – how could I not? – I think that the sense of community strikes me as most important as it endures and sees us through all kinds of stuff. I’m really excited by new solids, tone on tone & blenders as options outside of or within fabric lines. I’m also glad to hear that manufacturers are slowing down the new release frenzy & that many lines will have fewer individual fabrics in the line. I love working with fabric lines adding in blender, neutrals, & solids to the mix. I love that they’re coming out with new collections less often – it can get to be too much! Love the idea of the tone-on-tone collection you mentioned! I do like the less fabric lines coming out trend. It got to the point where I wasn’t interested in looking at fabric because there was just too much! 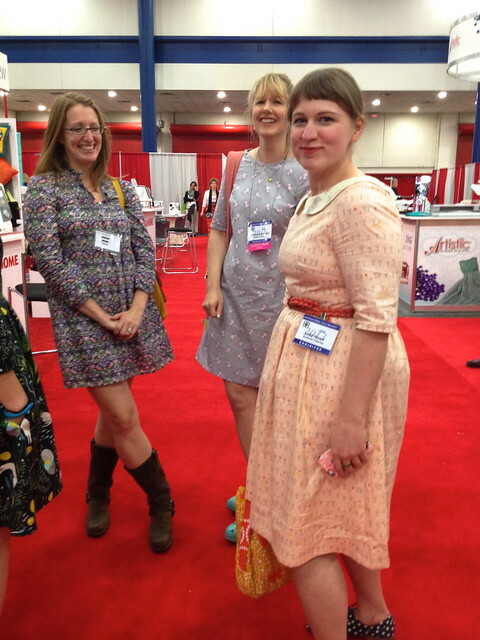 When Quilt Market comes back to Salt Lake City, I shall take you out to lunch/dinner/breakfast/drinks. These pick your one thing questions are so hard… I love Alissa’s “solids”. I saw her post a few days back and loved crossweaves as they aren’t “flat” solids. I see more interesting use of solids, quilts made totally of different solid colors but the design is so special that you don’t initially notice it is all solids. I am glad to see the pace of new lines slowing a bit, and hopefully we will continue to see some truly beautiful collections as a result. And… there is something about the Botanics (and preceding Architextures) designs that really speak to me with both their depth and simplicity at the same time. I would love it if they really did slow down. I can’t “make” fast enough to keep up with all the “must have” fabric. And by the time I decide I want some more, it is gone. Thanks for your thoughtful analysis. The idea of releasing fewer fabric collections will give all of us an opportunity to truly relish in our purchases (and perhaps even make something with them) before another new line presents itself. Wowee – after watching that Cotton & Steel vid I challenge anyone not to be exited about it! I can’t wait to see what the girls come up with and love the idea of 5 lines that play well together, something that every quilter dreams of. I’m also excited about all the solids coming out. I love being able to find that exact, perfect colour I’m looking for. I also love the ‘like solids’ that AMH will have out soon. It’s nice to have a little background interest in there, much like all the cool Alison Glass single colour fabrics. Thank you for the great tour of Market. Have to get to one of these one day! Thanks for the great pics, Kathy. I think my favorite of all the trends is that there won’t be SO many new lines! I love so many of them and have trouble resisting, but it’s hard to decide what I “can’t live without” without having to start living in my car.